CareCredit knows pets are family too. That’s why they offer veterinary financing to help keep your most cherished family members in top shape, and why we accept it! Whether you use it to cover annual expenses like preventative care check-ups or for unexpected costs like pet prescriptions and emergencies, the CareCredit healthcare credit card makes it easy to give your pets the care they need, when they need it. So you’ve either found or lost a pet and don’t know what to do. We’ve put together this quick guide to help get you on the right path of finding your beloved pet or reuniting the furry friend with their human. 2) Post on Facebook: Fido Alert all the details: a photo, collar description, pet description, special needs, phone number to call/email address to email, reward if any, and the last place/time/date the pet was seen. 5) Contact your local Animal Shelter and let them know your pet is missing. You can google COUNTY ANIMAL CONTROL +ZIP CODE to find your closest one. IE: COUNTY ANIMAL CONTROL 94598. Be sure you contact them DAILY regarding your lost pet! 6) Visit local animal businesses like shops, stores, grooming, and veterinary hospitals. Ask if they have seen your pet, and if you can leave a flier (step 4). 7) Don’t lose hope! Some pets return in hours, others in years. We always recommend microchipping your pet as a collar can be lost, but a microchip is forever. 1) Call your local animal hospital and ask them to scan the pet for a microchip. If the pet has a microchip, the hospital can help you locate the owners right away. 2) Post on Craigslist some details: a not-so-detailed photo, pet description, phone number to call/email address to email, and where the pet was found. Consider having the owner verify something about the pet – a special patch of fur, collar description, etc – this way you know you are reuniting the pet with their rightful owner. 3) Post on Facebook, Fido Alert: a not-so-detailed photo, pet description, phone number to call/email address to email, and where the pet was found. Consider having the owner verify something about the pet – a special patch of fur, collar description, etc – this way you know you are reuniting the pet with their rightful owner. 5) Contact your local Animal Shelter and let them know you found a pet; you can discuss with them if it’s best you bring the pet to them or keep it at your home until the owner is found. You can google COUNTY ANIMAL CONTROL +ZIP CODE to find your closest one. IE: COUNTY ANIMAL CONTROL 94598. Encina Veterinary Hospital is committed to providing the very best customer service, and that includes keeping your pet cool, calm, and fear free, with each visit to us. Leave their carrier out in plain sight (for them to see and explore) a few days before the appointment with us; this will help the pet understand the carrier is okay, not necessarily associated with the veterinarian, and give them a chance to get use to it (extra tip: sometimes a dirty/worn shirt by you in the carrier can help keep the pet feeling safe in the carrier when in use). 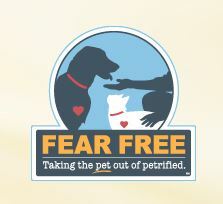 You can also purchase FELIWAY (pheromones that help encourage pets to stay calm via plug in diffuser or spray), and use them at home before the appointment. (extra tip: you can spray FELIWAY on a towel or blanket, put it in the carrier, and this may help keep your cat calm while traveling in the carrier). If you don’t feel comfortable waiting in the lobby with your cat, give us a call when you arrive in the parking lot and we can check you in over the phone. When it’s time to get you in a room, the Doctor’s Assistant will come outside and let you know we’re ready. We try to use exam rooms 6 and 7 primarily for cats as it’s farther away from the chaos of our pharmacy area and more removed from the lobby. Don’t hesitate to request one of these two rooms! Leave their carrier/leash out in plain sight (for them to see and explore) a few days before the appointment with us; this will help the pet understand the carrier/leash is okay, not necessarily associated with the veterinarian, and give them a chance to get use to it (extra tip: sometimes a dirty/worn shirt by you in the carrier can help keep the pet feeling safe in the carrier when in use). You can also purchase ADAPIL (pheromones that help encourage pets to stay calm via plug in diffuser, collar, or spray), and use them at home before the appointment. (extra tip: you can spray ADAPIL on a towel or blanket, put it in the carrier, and this may help keep your pet calm while traveling in the carrier). If you don’t feel comfortable waiting in the lobby with your pup, give us a call when you arrive in the parking lot and we can check you in over the phone. When it’s time to get you in a room, the Doctor’s Assistant will come outside and let you know we’re ready. You may choose to limit food intake before the appointment with us to help increase the effectiveness of treats while here with us. If you’re pup has some favorite treats, don’t hesitate to bring some with you! Leave their leash out in plain sight (for them to see and explore) a few days before the appointment with us; this will help the pet understand the leash is okay, not necessarily associated with the veterinarian, and give them a chance to get use to it (extra tip: sometimes a dirty/worn shirt/towel/blanket by you in the car can help keep the pet feeling safe due to familiar smells). You can also purchase ADAPIL (pheromones that help encourage pets to stay calm via plug in diffuser, collar, or spray), and use them at home before the appointment. (extra tip: you can spray ADAPIL on a used/worn towel/blanket/shirt, and place this in the back of your car where your pup stays while you’re driving). If you have any questions or concerns – give us a call. We’re committed to providing you with the best care possible – including before you walk through our doors.